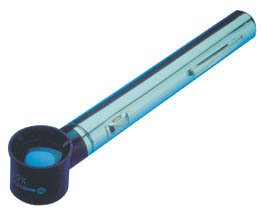 If you take the lens out of this lighted magnifier, you will see that it is a single lens ground in an hourglass shape. It is this feature that makes the Coddington magnifier so effective at achieving distortion-free magnification, even at the periphery of the lens. A bulb inserted in the groove of the Coddington lens illuminates the object being examined. The unique optical properties of the groove disperse the light from the bulb evenly across the field of view. Requires two AA batteries (not included).